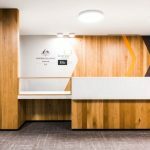 Following the relocation of the Department of the Attorney General (DotAG) into the new Old Treasury Building, IA Design were engaged as the Lead Consultant to design a sophisticated and welcoming environment for the new Perth office. It was critical to satisfy the ways of working of the lawyers and staff who required private space whilst achieving a flexible working environment. Whilst there was substantial built environment there was a greater allocation of space dedicated to flexible, collaborative, and open plan working areas. This project involved the collocation of several legal agencies and the Department of Treasury and GESB into 13 floors of what is now known as the David Malcolm Justice Centre. The major challenge for this project was in finding common ground and direction across the agencies and navigating the political discourse, in order to find a solution that satisfied GOA directives and the wishes of the Director General of DotAG. The briefing process was therefore both intensive and extensive and continued throughout the life of the project. Controlled communication was the only way to navigate this and we believe the outcome for the client is excellent. The outlook of the building provided a primary driver for the interior space planning. The common meeting suite on Level 23 maximises this with a sophisticated and contemporary fitout which caters for all agencies. Maintaining the views to the river, hills and ocean was essential but required a large amount of change management to bring many tenants along the journey. 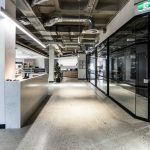 The result is a series of well designed, and functional spaces which maximise the available space in a fitout that will satisfy the needs of the agencies for at least another ten years.